Milan: Arnoldo Mondadori Editore, 1992. This is the first Italian hardback edition of Coyote Waits. It was published in Milan, Italy by Arnoldo Mondadori Editore in 1992. 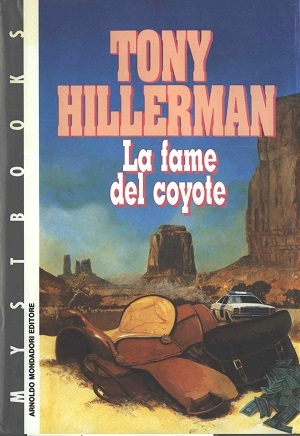 Tony Hillerman's original text in English was translated into Italian by Stefano Negrini. The title translates to, "The Hunger of the Coyote." The cover was illustrated by Massimiliano Longo and designed by Staff Milano. It features a saddle and a saddle bag with dollar bills spilling out. In the background there is a Monument Vally-esque scene with a police car driving towards the saddle bag. Format: Hardback, 23.4 x 16 cm. Binding: Gray boards and spine with the author and the title printed vertically in white on the spine.